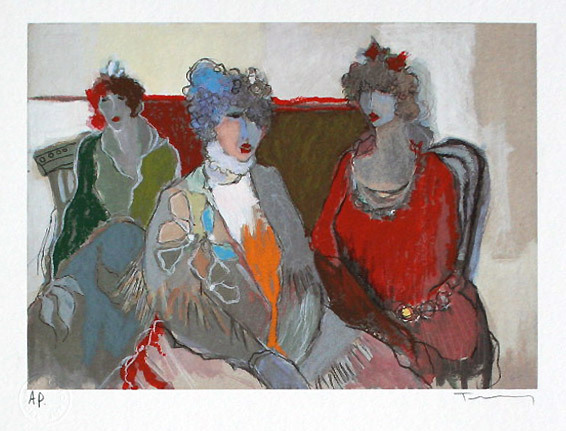 ITZCHAK TARKAY RARE FABULOUS BEAUTIFUL ORIGINAL SERIGRAPH. Hand signed. Artwork is in excellent condition. Certificate of Authenticity included. BItzchak Tarkay was born in 1935 in Subotica on the Yugoslav - Hungarian border. When he was only nine years old, the Nazis sent Tarkay to Mathausen concentration camp. After the war, he returned home and developed an interest in art where he; began winning artistic awards for his excellence in painting. In 1949 he and his family immigrated to Israel and spent two years in a Kibbutz. In 1951, Tarkay received a scholarship to the Belalel Art Academy in Jerusalem and studied under the artist Schwartzman. Tarkay later enrolled in the Avni Institute of Art, which he graduated in 1956. Tarkay has achieved strong recognition as a leading representative of a new generation of figurative artists. The inspirations for his work encompass influences from Impressionism, and Post-Impressionism, and color influences of Matisse. His style has a feeling of the drawing style of Toulouse-Lautrec. In addition to being a gifted painter and watercolorist, Tarkay is a master graphic artist. Tarkay has since exhibited extensively both in Israel and abroad, and his works are widely collected by both public institutions and private collectors. Tarkay is considered one of the most influential artists of the early 21st Century and has inspired numerous artists throughout the world, with his reflective depictions of the female form. Click the button below to add the Hand Signed The Aristocrats by Itzchak Tarkay Retail $585 to your wish list.